Spring is coming! But, to hasten its arrival, my wife recently bought me a very bright Nautica watch. 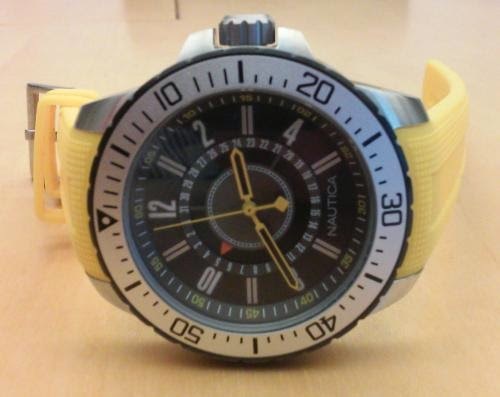 It's the Nautica Unisex NST 15 Date Watch (Model N14663G) with a bright yellow band. I've long admired Nautica watches because they have innovative designs and solid construction. Unfortunately, one of my co-workers wears awesome Nautica watches all the time and I don't want to steal his style. No one likes a copycat. Style. I like this watch dial design because it combines retro sensibilities and innovation. 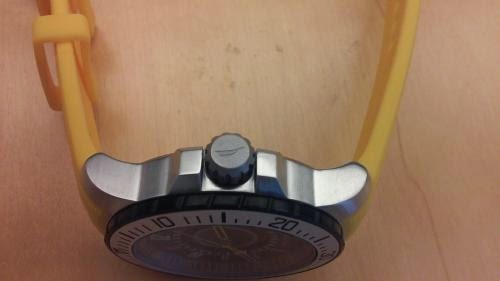 I think that this Nautica watch looks like a dive watch from the early 1970s. It is well proportioned with a 45 millimeter diameter case that is just over 13 millimeters thick. But, the inner part of the dial contains a very cool retro-grade calendar. In the first picture, notice the orange arrow pointing to the 5th day of the month at 10 o'clock. How cool is that? However, I must confess that I can't read the tiny date numerals at all. That's what an old guy gets for trying to be hip. The 20 millimeter wide yellow band is quite bright and takes some getting used to. 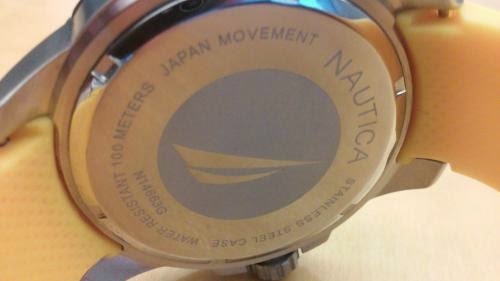 However, there is a similar Nautica watch with a dark blue band. Construction. The Nautica NST 15 Date Watch is solidly constructed with a stainless steel case, bezel and case back. A screw down crown helps ensure 100 meters of water resistance. According to Amazon ad copy, the watch is suitable for snorkeling or swimming, but not diving. That's too bad because the watch also has a unidirectional rotating bezel. I love those for the functionality of being able to measure elapsed time. The dial is protected by a mineral crystal for scratch resistance. Finally, beneath the beautiful exterior lurks an ever reliable Japanese quartz movement. Overall, I highly recommend the Nautica NST 15 Date Watch. This is a watch deal that I'm excited about. It's a great looking watch and it's a great watch value for the money.